Each Thursday throughout the regular season, The Pick List will feature six of the best match-ups across the state, and make our predictions on a handful of other games. One of the premier large-school rivalries in Kansas, Class 6A powers Hutchinson and Derby meet for the 18th time since 2004. Hutchinson holds an 11-6 margin in the last 17 meetings, though Derby has won the last three convincingly (49-14, 46-20, 40-7) and five of the past six. Derby defeated the Salthawks in the regular season and again in the playoffs in 2016. In 2014, Derby beat Hutchinson, 35-28, in the regular season, and then the Salthawks pulled off a 35-28 playoff win en route to an appearance in the state title game. Derby had its 24-game winning streak end with a 50-20 loss to Goddard in Week 2. Then, the Panthers rolled up a program record 676 yards in last week’s 60-28 victory against Maize. Derby was unsettled at quarterback in the first two weeks, but Grant Adler took over last week and delivered 191 passing, 196 rushing and five touchdowns. Brody Kooser, one of the state’s top backs, had 211 rushing yards and three scores. Derby has generally enjoyed great dual threat quarterbacks in recent seasons, notably with Brady Rust and Dan Dawdy in the spread offense, and Adler could continue the tradition. Derby has outscored teams 128-92, while Hutchinson is at 118-48. The two each rank in the top-six in Class 6A scoring offense. In the first three years with coach Ryan Cornelsen, Hutchinson scored 33.6, 33 and 39.3 points a contest. However, the defense has permitted 22.1, 23 and 23.1 points a game. (Derby allowed 12.2 en route to the ’16 state title). Hutchinson is 26-11 under Cornelsen, including a 22-21 season-opening road win against Olathe East and big victories against Newton (41-7) and Salina Central (55-20), two teams that have struggled. Cornelsen has an uncanny ability to win close games, dating back to his Hays High days. Since ’09, his first year with the Indians, Cornelsen is 17-6 in games decided by eight points or fewer. That includes a 4-1 record in one-point margins, and 2-0 in overtime games. Against Olathe East, Hutchinson went for a make-or-break two-point conversion, a hallmark of several signature Cornelsen victories during the years. Brody Smith, who had successful surgery on his arm after a late offseason car accident, scored the game winner and two-point conversion. Smith wore a cast on his arm in the game. Hutchinson has used its ground-and-pound offense with Smith, running back Tayezhan Crough and fullback Joesiah Galindo. Hutchinson will run the ball and control the clock, but overall, Derby has too many weapons. A pair of undefeated teams will clash in a Centennial League battle when the Shawnee Heights T-Birds face the Topeka Seaman Vikings on Friday. Seaman is fresh off an impressive 17-6 win over Topeka Hayden. Before that, the Vikings recorded easy victories over Topeka West and Topeka Highland Park. Defensively, Seaman has allowed only 12 points all season and only 117 yards per game. Junior linebacker Sam Payne leads the Vikings with 31 tackles. The offensive focus has been on the ground as Seaman averages 230.7 rushing yards. Dalton Temmen leads the Vikings with 212 yards and two touchdowns on 33 carries. Quarterback Kobe Jones has added 160 yards and two touchdowns on 24 attempts. Jones has also completed 15 of 34 passes for 198 yards and four touchdowns with only one interception. Payne leads the receiving corps with eight catches for 88 yards and two touchdowns. Shawnee Heights also boats an undefeated record after posting wins over Topeka West and Class 6A schools Manhattan and Washburn Rural. Last week, the T-Birds topped Rural 20-15. Like the Vikings, Shawnee Heights focuses on the ground attack. The T-Birds average 247 yards rushing and 83 through the air. Senior Mitchell Lady leads the Heights rushing attack with 198 yards on 34 carries. Lady has also completed 12 of 18 passes for 249 yards and two touchdowns. The Vikings won last year’s meeting 24-21. Seaman and Shawnee Heights join Topeka High as the only undefeated teams in the Centennial League. The Pittsburg Purple Dragons are no longer in the Southeast Kansas League. However, their departure from the league doesn’t prevent them from continuing their rivalry with southeast Kansas foe Fort Scott. Pittsburg will try to bounce back from a 34-13 to Missouri powerhouse Webb City. In that game, Pittsburg took an early 13-6 lead, but Webb City scored the game’s final 28 points. The Cardinals are 5-0 and the top-ranked team in Missouri’s Class 4. Dragons quarterback Chase Curtis passed for 148 yards and a touchdown in the loss, but he also threw two interceptions. Before the loss to Webb City, the Dragons earned wins over the SEK’s Chanute (54-7) and Missouri’s defending Class 4 champion Harrisonville (37-21). Fort Scott will be only the second Kansas opponent for Pittsburg this season. The Tigers have opened their season with lopsided wins over Parsons, Independence and Chanute. Based out of the split-back veer, Fort Scott averages 370.7 rushing yards. Senior Zarek Fewell already has 515 yards and 10 touchdowns on only 40 carries. And that’s not a misprint. He’s averaging 12.9 yards per carry with a touchdown in one out of every four rushing attempts. Senior quarterback Jesse Jones has passed for 193 yards and two touchdowns. Senior Gunnar Brown is the Tigers’ big-play threat with three catches for 115 yards. This is the second time Fort Scott and Pittsburg will play since the Dragons left the SEK. Pittsburg is on a four-game winning streak in the longtime series. Last year, Pittsburg won 28-0. Buhler defeated Maize South, 21-14, in this matchup last season, and then 27-7 in the sub-state championship game. The Crusaders lost in the season opener, 33-21, to McPherson and then defeated Andover Central, 37-7, before a big road win against Wichita Collegiate, 47-21, last week. Maize South has been very dominant with three straight shutouts of Circle (47-0), McPherson (9-0) and Kansas City Washington (58-0). Circle and Washington are both 0-3 and have combined for 36 total points. McPherson averaged 35.5 points a contest in its other two games. Against McPherson, Maverick punter Andrew Bliss downed the Bullpups at the 1-yard line. Maize South forced a safety and led 2-0. After the free kick, Maize South scored just before the half for the final points. McPherson had several scoring chances in the first half, including a turnover on downs at the Maize South 6-yard line and a missed 40-yard field goal. Maize South has traditionally been known for strong defense and delivered two shutouts last year en route to a 10-win season. In 2012, Maize South permitted just three points in its first three contests with shutouts in Weeks 2 and 3. Class 4A-I Basehor-Linwood and the Mavericks are the only Kansas 11-man teams to not permit a point, according to Prep Power Index. Last week, Buhler led Collegiate 27-7 in the middle of the third quarter. The Spartans were ranked No. 1 in Class 4A-II. Buhler had nearly 500 rushing yards, including 305 and four rushing scores from Dalton Brown. The Crusaders have plenty of decorated linemen, including Lawson Schultz, Braden Rose, Brendan Webb and Brayden Lock. As well, the defense limited Collegiate’s spread offense to negative rushing yards. After the Week 1 blip against McPherson, it looks like Buhler is rolling again. The Caney Valley Bullpups will travel to Humboldt to take on the Cubs in a game to decide Tri-Valley League supremacy. Caney Valley stepped up a couple of classifications and opened with a 41-12 romp over Class 4A-I Independence. The Bullpups built a 41-0 lead and rushed for more than 420 yards in the game. Grant Richey rushed for 259 yards and three touchdowns in the win, while Matt Simpson added 102 yards and two scores. Carter Brown also added a touchdown run. Caney’s lone loss came Week 2 at home against Olpe. After Richey gave the Bullpups an early lead, Olpe scored 20 consecutive points in the first half to lead 20-7. The Eagles were successful at slowing Caney’s wishbone attack. Last week, the Bullpups got back on track with a 47-0 blanking of Leon-Bluestem. Humboldt, meanwhile, enters this contest unbeaten and carrying a defense that has only given up 15 points all season. The Cubs also shutout Bluestem, 58-0, before consecutive tough wins over Cherryvale (22-8) and Neodesha (18-7). Senior Jacob Barker leads the Cubs with 349 rushing yards and a touchdown, while classmate Hunter Murrow has rushed for 340 yards and five scores. Barker earned all Tri-Valley League designation as a running back after rushing for 1,120 yards and 11 scores in 2016. Murrow has only completed 3 of 18 pass attempts this season, but if he’s forced to pass, he’s looked towards Wyatt Seufert and Teryn Johnson. Seufert leads the Cubs with 82 yards receiving and two scores. Junior Dagen Goodner leads the defense with 24 stops this season, while David Watts already has six tackles for loss. Caney won last year’s meeting 37-6 and had won six straight in the series until the Cubs’ 22-20 victory in 2015. A huge Northern Plains League matchup between eight-man state title contenders takes place in Scandia. Last year, this turned out to be one of eight-man’s best regular season contests, a back-and-forth game that Osborne eventually closed out in the final seconds, 34-32. 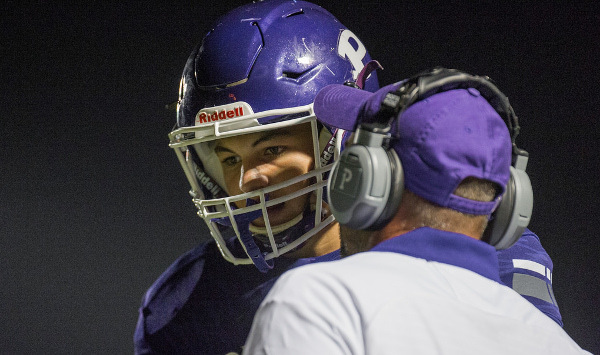 In November, Osborne coach Cullen Riner pointed to the Pike Valley home win as a key turning point en route to a 13-0 season and Eight-Man, Division I state title. Osborne broke its own single-season eight-man scoring record with 764 points. Pike Valley went 10-2 and fell in the Division II sub-state title game to eventual champion Hanover. The only other meetings in the series since ’04 came in ’12 (a 50-40 Pike Valley win) and ’13 (62-12 Osborne victory). This year, Osborne has opened 3-0 with another prolific offense after it graduated classification MVP and all-purpose threat Cullen Grabast, along with quarterback Justin Burch and all-state lineman/linebacker Derek Naegele. Osborne has outscored teams 178-20 and is tied for first in the classification in scoring offense. Pike Valley has a collective score of 176-28 and stands second in Division II in offense. Osborne has heavily run the ball with 35 passing and 341 rushing yards a game. The Bulldogs have used a running play on 91 percent of snaps. Last season, Osborne ran the ball on 86 percent of snaps for 343 yards a contest. Senior Denton Schurr, who finished just short of 1,800 yards as a junior, has 31 carries for 300 yards and seven scores. Sophomore Darrien Holloway collected 626 rushing yards as a freshman, and he has stepped into a key role with 24 carries for 237 yards and four rushing scores. Junior Darnell Holloway has emerged in his first season as the starting quarterback with 25 carries for 378 yards and seven rushing scores. Last season, Osborne trailed 18-14 at halftime to Pike Valley. In the second half, Osborne kept things simple and heavily emphasized Schurr and Grabast in the comeback. Osborne does have returning experience on the lines with seniors Roxton Brown and Bryon Roenne. Pike Valley counters with its standout four-year starting senior trio of quarterback Davante Hammer, running back Lane Peters and end/linebacker Cole Strickler. Peters has more than 4,000 career rushing yards. He and Strickler each tallied at least 160 offensive yards versus Osborne last season. This season, the Panthers average 122 passing and 267 rushing yards a game. Hammer has thrown for 307 with a 6/2 TD/INT ratio. Coach Don Melby, in its 40th year on staff, wanted to spread the carries more this season and not rely so heavily on Peters. He has 52 rushes for 395 yards and nine scores, while Hammer has 35 carries for 188 yards and two rushing TDs. Strickler has 15 offensive touches for 236 yards and three scores. This game will likely come down to how well Pike Valley’s defense can limit Osborne’s terrific running game and turnovers/special teams. Last year’s game turned when Osborne picked off a pass when it bounced off a Panther offensive player’s hands near the end zone. Pike Valley finished 1 of 5 on two-point conversions. Many of the key matchups between Division II and Division I schools this season and last have went the Division I’s school’s way. Osborne scores enough with its ground game to win.